"At first, I was so scared because we had no one." Abby Alovera (right) credits her mother's hard work and numerous self sacrifices for her success in Canada. Glenda Conde remembers the fear of coming to Canada in 1994. Back then, the newly-landed immigrant arrived from the Philippines with her daughter Abby and a little more than US$100 gifted from friends and family. "I was so afraid. At first, I was so scared because we had no one. No one — as in we had no relatives here to run to. We basically started from nothing," says Glenda. The pair settled in Oakville, Ont. It wouldn't be years later until Abby fully understood what her mother gave up to secure a better life for both of them. "I didn't realize it at the time what you had given up; I was six. But I knew it was sad because everyone else was sad," she says. "It was literally your whole life." 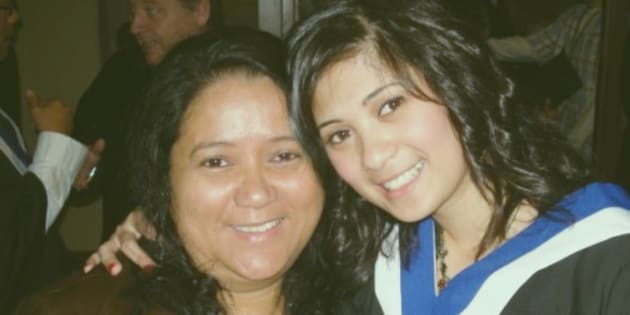 Glenda and Abby are part of some 220,000 Filipino immigrants who entered Canada since the early '90s in pursuit of better economic opportunities. They've since found financial security, something Abby attributes to her mother's work ethic, which Abby has sought to emulate. "I don't want to call it immigrant guilt, but I worked so hard because I know what you had to do to get me here. And that's my motivation every day." We want to hear your stories — join the conversation on Twitter at #BornandRaised or send us an email at bornandraised@huffpost.com. Her Asian Upbringing Left Her Without A Voice. She Took It Back With Art.